Center Steer Tugger Trailers (TT-CS) achieve exceptional maneuverability with a fifth caster in the center of the frame. This wheel is slightly larger than the others, allowing the entire unit to pivot in place. This makes the TT-CS ideal for pulling loads by hand, or in narrow aisles with tight turns. The TT-CS can also function as part of a logistics train, vastly improving efficiency in order picking applications and raw-material delivery for manufacturers. 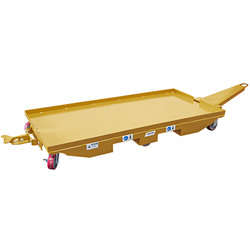 Like all Tugger Trailers from BHS, the TT-CS features heavy-duty steel construction and a powder coating that’s formulated to resist common sources of equipment damage in industrial applications. Call the BHS sales team at +1 314 423 2075 to learn more about Center Steer Tugger Trailers and other material handling solutions for your industry. Fork pockets allow relocating the Tugger Trailer by lift truck to and from a worksite. Exchange spring-loaded auto latches for rigid pincer-style hitches; ideal for rough terrain.